Slavery is a word which immediately conjures up very specific images in our minds. When it is mentioned we tend to think of people, almost always black people; degraded, abused and bound in chains, and we tend to think of such images, and the word slavery itself, as belonging to another era. We do not see slavery as belonging to our world, not as something which is still happening today. Yet the truth is that if William Wilberforce were alive today and he travelled to different parts of the world - not just in Africa, but also in large parts of Asia, the Middle East, South America and even parts of Europe - he would find children living in conditions and circumstances which Wilberforce would understand and which I am sure he would describe as slavery. It is believed there are nearly nine million children around the world today who are enslaved. There are international charters and covenants which try to come to a legal definition of what constitutes slavery. In essence these documents define slavery in the modern world as a situation where a human being and their labour are owned by others, and where that person does not have the freedom to leave and is forced into a life which is exploitative, humiliating and abusive. One of the characters in the film I have made for the BBC is Dalyn, a young girl from Cambodia, who after years of counselling and therapy was able and willing to talk to us about how she was sold into sexual slavery in a brothel when she was 12 years old. Dalyn represents just one of the estimated 1.2 million children that the International Labour Organisation believes are trafficked every year. Tricked and forced into prostitution, Dalyn spent much of her time locked in a cage with others underneath a brothel - starved, beaten and threatened at gun point until she agreed to service clients. Then there is the gentle and sweet 12-year-old boy Mawulehawe from Ghana, who is sold by his mother to a fishing "master". Far from being the sadistic and immoral person you would expect, master Aaron is friendly and completely open about what he does and his motives. Mawulehawe sits and listens as he is haggled over, eventually being sold for �25 ($48). Many people will be shocked and horrified by such a figure. How can anyone, let alone a mother, put a price on a child's head? But �25 in Mawulehawe's village is the equivalent of two months salary for a local teacher, or enough water to meet the needs of a family of six for over three months. In selling him to a fishing master, his relatives believe that far from being sold into anything approximating slavery, Mawulehawe is being given an apprenticeship, a chance for him to learn a trade. But of course, not all fishing masters are as seemingly caring and gentle as Aaron. Many of the boys which Mawulehawe eventually joins, tell of the beatings, the dangers of diving to loosen trapped nets and the fatalities in this utterly unregulated industry. Nearly three thousand miles away in Saudi Arabia, six-year-old Ali was picked up by the authorities for begging on the streets of Jeddah. He was smuggled into Saudi Arabia from Yemen for this purpose. Ali says he ended up begging after being beaten with a metal wire when he said he did not want to beg all day. 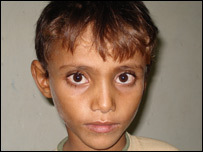 Ali is one of thousands of Yemeni children sold to gangs and forced to beg each year. Many of these children smuggled over the border are often sold by families who are duped into believing their offspring will get a better life. Like many other news reporters, I have reported on children around the world who have been soldiers, prostitutes and workers at ages where their counterparts in the West would be in primary schools. But news reports about child soldiers or prostitutes invariably turn to adults and international bodies to describe, analyse and contextualise the experiences. In this documentary, we get to see and learn about the world of modern slavery in which these children live, through them, and as a result it provides a complex, disturbing, surprising and vivid look into a world many of us adults are oblivious to. I was born in Somaliland, the self-declared republic in the north of Somalia, where my relatives still live. A couple of miles outside the capital Hargeisa is a vast and flat savannah landscape that still belongs to nomads who herd camels and goats. Here, I met a shepherd boy called Abdi, tending his family's 35 goats and reflected on the fact that only one generation separates me from Abdi. I live in a comfortable house in west London, my children have scooters and summer holidays, yet my life could easily have been exactly like Abdi's. My mother was a nomadic shepherd, and as a girl tended the family's animals. 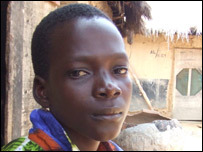 Abdi may well have to work instead of going to school, but he is not enslaved. Slavery means you do not have the freedom to say no.